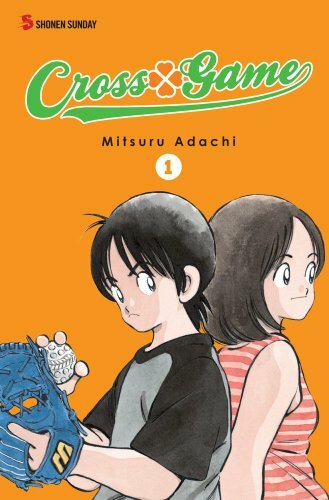 There’s a conversation that almost always starts when someone mentions a sports manga like Mitsuru Adachi’s Cross Game (from Viz’s Shônen Sunday imprint). Those among us who left athletic pursuits behind as soon as society permitted it (basically, once we had completed our high-school physical education requirements) ask if the comic is about sports or about people who play sports. Will we, as conscientious objectors to competitive athletics, be asked to care about the minutiae of some particular sport, an interest many of us cannot be bothered to fake even for loved ones, or do we just need to like the characters and let the details wash over us? While the details of baseball matter to a certain extent in Cross Game, they’re easy enough to ignore in the wake of the characters, a complex and sympathetic group who also manage to be idiosyncratic and funny a lot of the time. In other words, Cross Game is undeniably about baseball, but it’s not so much about baseball that people who don’t give a fig about the sport won’t find their price of admission paid in a variety of other ways. One of those ways is Adachi’s own idiosyncratic nature as a creator. The tone of the three-volume introduction to Cross Game shifts a great deal from chapter to chapter, sometimes page to page, but the shifts work. Low comedy sits comfortably next to innocent romance, just as sly slice-of-life isn’t out of place near unexpected tragedy. It really is marvelous to watch Adachi mix and match but still make all of these disparate bits seem like they’re part of the same whole. Part of that has to be due to his fluid art style. It’s got innocence to it and simplicity of line, but that doesn’t keep it from exhibiting strength and wonder. I sometimes think that’s one of Tezuka’s greatest contributions to cartooning – abundant evidence that something can be simultaneously cute and forceful, goofy and moving, delicate and muscular. Adachi lives up to Tezuka’s example nicely, even throwing in some of the master’s bits of fourth-wall breakage. He also does a nice job with the small modulations of a cast that ages about five years over the book’s three volumes. Another part is that he writes well, particularly in terms of creating engaging, root-worthy characters with a few simple strokes. We meet average kid Ko Kitamura, son of the local sporting goods franchise and an indifferent athlete, and we’re introduced to the four Tsukishima sisters, heirs to the local batting cage and café. It’s clear that Ko is our core protagonist, but it’s equally clear that the manga isn’t really about people standing around and admiring him. It feels like an ensemble piece, even if it isn’t in its secret heart, but it’s always nice when a creator goes to the effort of camouflaging the obvious conclusion. The first collection reads in a breeze, and I’m fairly sure that the only reasonable response when setting it down is, “That was really, really nice.” The rather odd back-cover text suggests that Cross Game “will change your perception of what shônen manga can be,” which might be asking too much of it, but it’s got an off-kilter quality – a willingness to give its subject a sidelong glance rather than charge at it — that certainly helps it stand out from the pack. It’s unusual and, partly because of that, kind of lovely. This entry was posted on Monday, November 8th, 2010 at 7:02 am and is filed under From the stack, Viz. You can follow any responses to this entry through the RSS 2.0 feed. Both comments and pings are currently closed. One thing I really liked about the previous Adachi series I read is how he builds the characters (both the main and supporting) over time. It’s a good move by Viz to release future volumes as two-fers, as that will help keep the series moving along better. I’m informed that it gets to be more “about baseball,” though still very much about the people who play baseball, so it seems likely to please people across the spectrum. And of course–I’m utterly nuts for Swan (and hope someday, somehow, somewhere we get to see the final volumes of at least the first series in English). And as has been pointe dout many times, it’s very much in the old school sports manga mentality–with endless harder and harder goals, most of the pages devoted to actually showing the “sport”, etc (in fact art wise it’s VERY similar to Aim for the Ace). But then again, I love ballet, don’t consider it a sport even if the manga treats it as such, and have enough personal experience with ballet to uinfortunately find the CMX translation annoying when it messes up a term or name. *Anyway* umm I guess my point was, that i’ll eventually check this out. I admit the fact that it’s a triple volume makes it more appealing to me.